This is a great way to refresh your mind for the day and the week to come. You are gently guided through the meditation with the first half a meditation on the breath while the second half is an analytical meditation on a subject* chosen by our meditation teacher. This class is well-suited to both experienced practitioners and newcomers to Buddhism. 3 minute silent break to stand, stretch etc. Well-suited to newcomers to Buddhism or for those who need the discipline of a guided meditation. Venerable Drolma leads the session. The focus is on the breath with the aim of relaxing and clearing the mind, which will eventually lead to a sense of equanimity. Included in this session is "walking" meditation. Join us a for a calming session of meditation from the busyness of your day. The meditations will be different each week, bringing in the different aspects of the buddhist path that can allow quiet reflection. Learn and practice the skills in these relaxed sessions led by long-time student, Greg Carr. The sessions are an opportunity for new or experienced students, whether Buddhist or not, to meditate in a peaceful and conducive space. 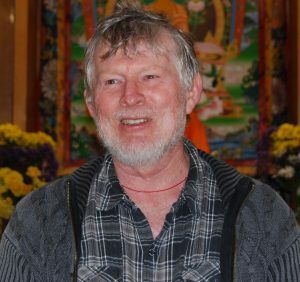 Greg has studied with Lama Yeshe, the founder of the FPMT, as well as other Buddhist masters and done many retreats during his more than 40 years of Buddhist practice. "Meditation is very simple. When hearing about meditation for the first time, you might think, That must be very special; meditation couldn't be for me but only for special people. This just creates a gap between you and meditation. Actually, watching television, which we all do, is a bit like meditating. When you watch television, you watch what's happening on the screen; when you meditate, you watch what's happening on the inner screen of your mind where you can see all your good qualities, but all your inner garbage as well. That's why meditation is simple. The difference, however, is that through meditation you learn about the nature of your mind rather than the sense world of desire and attachment. Why is this important? We think that worldly things are very useful, but the enjoyment they bring is minimal and transient. Meditation, on the other hand, has so much more to offer, joy, understanding, higher communication and control. Control here does not mean that you are controlled by somebody else but rather by your own understanding knowledge-wisdom, which is a totally peaceful and joyful experience. Thus, meditation is very useful." The video below is a timeless teaching by Ven Thubten Lhundrup on “Meditation with Buddhist Philosophy”. Recorded in 2004, it is an excellent introduction to meditation.